Calendar Making Software Helping You Make Your Own Calendars. Now you can make your very own calendars with the EasyCalendarMaker software. This user-friendly software helps you create your own personalised calendars. Your calendars can be made with the special software which will not only cost less than having a professional calendar printed, but will also allow you to make it more personal, making it perfect for your home or as a gift. 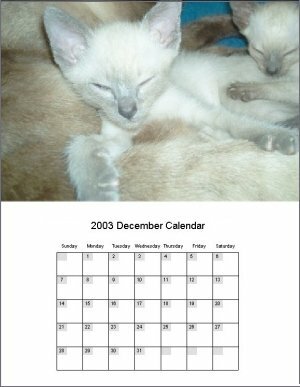 The calendar making software allows you to customise your calendars by including photographs of your loved ones or pets and also helping you choose your own design. The software also has built in photographs for you to use when you are making your calendar and you can even make it in other languages: French, Spanish Italian and German On top of this, the software also has a calendar preview window so you can see your calendar progress as you make it. This calendar making software gives you the chance to make a calendar as you want to see it and is very simple to use.